Why isn’t any of the news outlets asking the guy who made the statements what he thinks? The news is great at finding any body they want to do a story on. It would not be hard to find the man who is now a national talking point, thanks to a witch hunt led by the establishment media puppets. Yet, no comment from the guy who used his first amendment rights to ask a question and make his own statement. Better yet, why- when this is such a hot topic and media frenzy – didn’t the reporters at the event ask this man any questions on his remarks at the time? This was filmed live by every major network, and there were many, many, many reporters there. They all seemed to miss the golden opportunity to find out more or did they even want to? Makes one wonder if indeed this man was a plant? Especially when Megyn Kelly was ready- set-go with baited breath to do her focus group on his question. When she did, she certainly Gestapo style hammered down on “free thinking” and “impartial”, instead it was a “Do as I say or shut up” focus group. She literally glared and flared her nostrils at the woman who dared to say Obama came across like a Muslim in the things he said and did. “OBAMA IS NOT A MUSLIM!”, Kelly loudly and firmly scolded. The look in the eyes of the woman who dared to speak her mind in the focus group says it all. Poor woman, she had a look of SHOCK AND AWE. (see link to video below) She definitely looked dazed. As though she could not believe this was happening to her. It would be great to talk to the woman today and ask how she felt when Kelly bullied her. Especially in what was supposed to be an open, fair and so called balanced focus group to determine how the audience viewed the situation. It certainly was not. It was more like Megyn Kelly’s personal vendetta to get back at Trump and “I’ll show him group”. It was a moment for Kelly to receive Kudo’s from Obama for slapping down any and all free thinkers. Shame on Kelly for suppressing the first amendment rights of her focus group and exercising it totally for her, so called, free press self. This has the total appearance of an all out media blitz, designed to discredit the front runner Donald Trump. Will someone tell the puppet press that this attempt is backfiring like an old jalopy misfiring on a few cylinders? Or will the public just watch as the old clunker spits, sputters and finally blows a gasket, then slowly rolls off the road and stalls on the left wing side of the campaign trail? The media driven narrative is making the news look more and more like high school bullys while the only adult in the room, Donald Trump, is looking more and more like the principle. It appears the media has totally underestimated Trump supporters. Nor do they realize they act as the district superintendent of education, desiring truthful facts. From what I am observing, they have written up the media bully for bad behavior. But like any bully acting out, they could care less. Meanwhile, Trump supporters are not phased. They expected and even anticipated this behavior for they have watched it play out over and over again. At first they were angry at the lies and the fake Carly ritual going on but, today most of them are laughing and having fun pointing out all the down right lies. In fact there is so much Trump supporter backlash that it looks as though there is a social media contest to see who can make the best meme exposing the media darlings. They are working at it as though there was a million dollar prize for the one who comes up with the best one. Funny thing about pretending….you only fool yourself. That’s what I’ve been saying all along. I believe the guy was a plant. I think because he was only paid to ask the question not do interviews. After the Fox Debate when Megyn Kelly asked Trump such unthinkable question, we stopped watching her show. And now she is doing it again with her so called “focus group” and humiliating this lady. Obama was brought up in a Moslem environment. His Mom delved into all kinds of Religion. His father and stepfather as Muslims. The Koran and Bible are in their home. Obama attended Catholic and Moslem Schools in Indonesia. Even if he is attending Christian Churches, we really do not know what Religious affiliation he belongs to. No wonder people thinks he is a Muslim. Remember when he took office he went to the Middle East and apologized for Americans? Can’t understand for what? 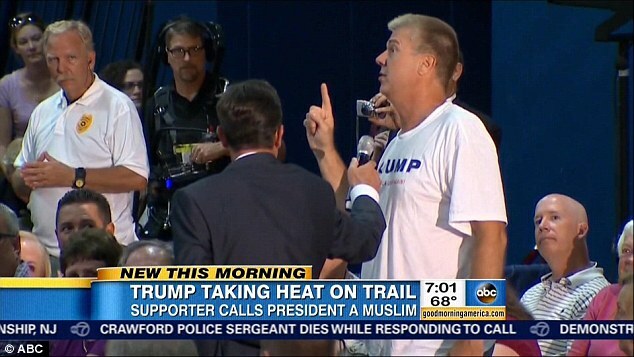 Anyways, that man in the audience who asked Trump a “gotcha” question was planted. Religion has nothing to do with running the country. Have you ever heard of separation of church and state? Our founders expressed it. Americans are arrogant, and should be apologized for. We are not god gift to the world, especially with Trump in office. if it looks like a duck, if it walks like a duck, if it quacks like a duck…..maybe….it is a duck. Obama is a great man. He is intelligent and understands many religions. He is for the people. trump, on the other hand could care less about the little guy. His corporate elitist friends will trample over everyone in his path. He should apologize for America’s arrogance. We are a not the god given boss of the world, we are just a part of it. Sure we are the most powerful, but we shouldn’t insist that others follow us. Who are we to say that our way is the only way? that’s arrogance. Thanks a ton for writing this awesome article.I really liked your blog and will definitely share this on my Instagram.Thank you so much for a great article.